Writing from life can be a tricky business. There are people to protect, faulty memories of events, and the pitfalls of self-censorship. In this workshop, we will employ techniques of poetry and fiction to create works of Memoir and Autobiographical Fiction. Through original writing exercises, we will learn literary techniques including character, dialogue, setting and story arc. In our writing, we will draw upon both the truths and lies of our experience because our lives are too rich not to write about and our imaginations too strong to ignore. Every writer will have the opportunity to workshop one original piece. All levels of writers are welcome. All levels of writers are welcome. Bushra Rehman’s first novel Corona, a dark comedy about being South Asian in the United States, was noted among Poets & Writers Best Debut Fiction and featured in the LA Review of Books among a new wave of South Asian American Literature. Rehman also co-edited the anthology Colonize This! Young Women of Color on Today’s Feminism which was included in Ms. Magazine’s “100 Best Non-Fiction Books of All Time.” Her first YA novel will be released by Tor/Macmillan in 2019. She has taught creative writing for over 15 years at organizations including Teacher & Writers Collaborative, Urban Word NYC and the Asian American Writers’ Workshop. Tuition: $325, Pre-registration Tuition: $300 if you register before December 15. To pay, please email twotruthsclass@gmail.com. The workshop legitimizes the stories we tell with a supportive, diverse cast of eager readers. Bushra has the ability to govern a group into a family. 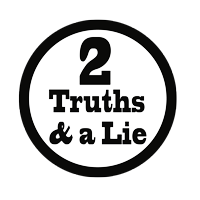 An adjective to describe Two Truths and a Lie is: reformative.